North Korea is encouraging investments from foreigners and will protect their legitimate rights, North Korean lawyers said on Monday during a tour of China in a bid to introduce its foreign investment laws and policies. North Korea promises to protect the rights of foreign investors in accordance with laws, a North Korea-based law firm said during a legal seminar in Beijing held by the Beijing-based Deheng Law Group. North Korea is gradually stabilizing its economy and has rolled out an economic development plan, said So Jong-chan, director general of the Korea External Economic Law Consulting Office (KEELCO) of North Korea, at the legal seminar. The country's foreigner investment law says that fields such as industry, agriculture, transportation and communications are open to foreigners, either through individual investment or a joint venture. Investors are especially encouraged to participate in projects that contain high-end technology, products that are competitive in international markets, infrastructure and scientific research, So said. Lawyers with KEELCO will tour China to introduce its foreign investment law and 26 economic development zones to potential investors in Beijing, Ji'nan, Qingdao, Shanghai and Shenzhen until April 13. KEELCO is an institute affiliated with the country's department of external economic relations and has about 20 licensed lawyers. Liu Kejiang, the director of Beijing Deheng Law Firm who invited the North Korean lawyers to tour in China, told the Global Times that the tour is aimed at helping investors understand North Korea's investment and trade policies in advance of the lifting of UN sanctions. Da Zhigang, director of the Institute of Northeast Asian Studies at the Hei-longjiang Provincial Academy of Social Sciences, told the Global Times that China completely adheres to the UN sanctions. The current communication on trade and investment between the two countries will serve future cooperation as North Korea will eventually integrate into the cooperation framework of Northeast Asia after the international sanctions are lifted. The trade and investment potential of the North Korean market is huge and trade is expected to flourish once sanctions end, Da said. 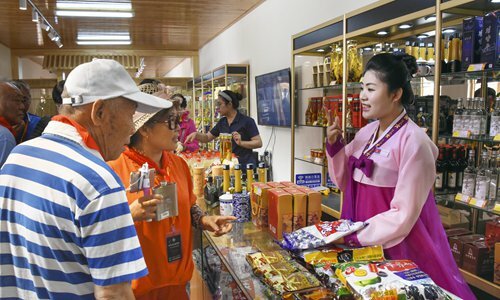 As countries with a shared border, China and North Korea enjoy certain advantages on trade cooperation given its sound bilateral ties and well-established cooperation foundation and convenient transportation, Da said. According to So, North Korea has signed investment protection deals with 27 nations, including Denmark, Russia, Iran, Vietnam, China and Thailand. But So also admitted that foreign investors will meet lots of difficulties, such as different culture, language and legal system. He told the Global Times that he believes those difficulties will gradually diminish as communication expands. According to So's introduction, the North Korea government protects the assets, business secrets and legitimate profits of foreign investors. Their property won't be nationalized or taken over by the government. They will go through legal procedures and get certain compensation if their property has to be taken in the public interests. Foreign investors can rent land from the North Korean governments for a maximum of 50 years and could apply for an extension. Except for some managerial and technical positions, foreign companies in North Korea should put the employment of locals first, the lawyer said. Foreign investment is banned in projects that damage national security and people's health or do not meet environmental protection standards and projects for the purpose of resource export. Lawyers from the KEELCO said the North Korean government is seeking foreign investors for the international exhibition center in Pyongyang, as the current Three Revolutions Exhibition center cannot meet the growing requirements of exhibitors. The total investment for the new 100,000-square meter exhibition center is about $21.41 million. Foreign investors will shoulder construction and material costs, while the North Korea side is responsible for the land, design, workers, electricity and water. Another project is the exploitation of deep sea waters located in the eastern waters of its territory, about 80 kilometers from China. North Korea can sign compensation trade agreements with potential investors or set up cooperatives together. Students, lawyers, companies from China attended the seminar in Beijing on Monday. Company representatives at the seminar were eager to learn about the foreign investment policies in North Korea.